Applications these days are visual. There’s no denying it. Applications these days are also social. Combine those two and, inevitably, you are going to need to enable your users to upload images and share them, either on their own or as part of larger creations. What we’re building today is a widget that you could easily embed within your own applications. It will take an image selected by the user, upload it to the Imagga servers and tag it, then automatically recommend the top tags for use within your app. The user will still be able to edit and customize the tags for an image, though their selections will be limited to the larger list suggested by Imagga to prevent spamming. In your own development, you might implement a widget like this as part of a social networking platform, such as a forum or image sharing service. Anytime users are able to upload and categorize their own images, it’s important to both streamline that process for them as well as put restrictions around those categorizations so that they are accurate and not misleading to your other users. If you’re merely interested in an overview of how an auto-tagging system like this can be built with Imagga, feel free to skip to the next section. If you’d like to follow along more closely, however, you can download the code from the sidebar to the right and use git tags to match the code with each stage. For example, if the stage is index-and-api-routes, just type in git checkout index-and-api-routes into your terminal to see the code at that stage. If you get stuck or make changes, you can always use get reset HEAD --hard to return to the base code for that stage or git checkout master to return to the completed code. You’ll also need to run an npm install within the repo to get the dependencies we need to run the application. 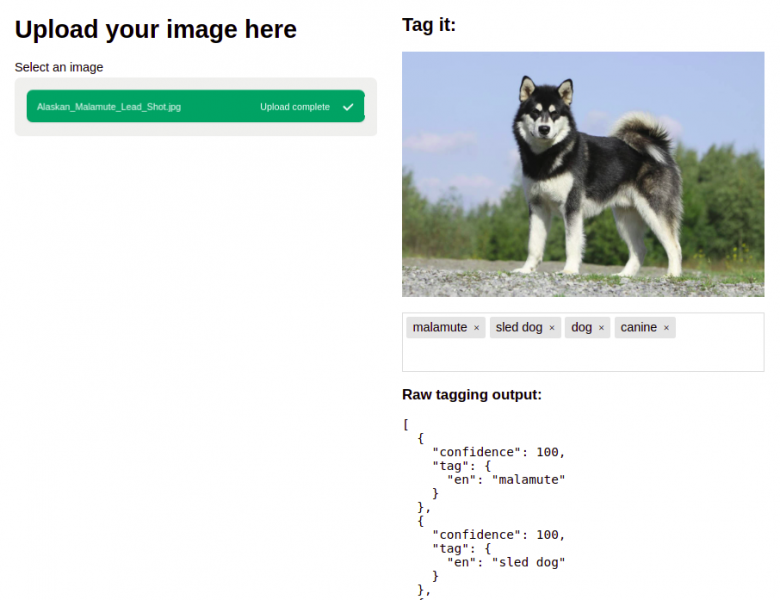 The tagging API accepts one of two methods for identifying the image you want tagged: image_url and image_upload_id. 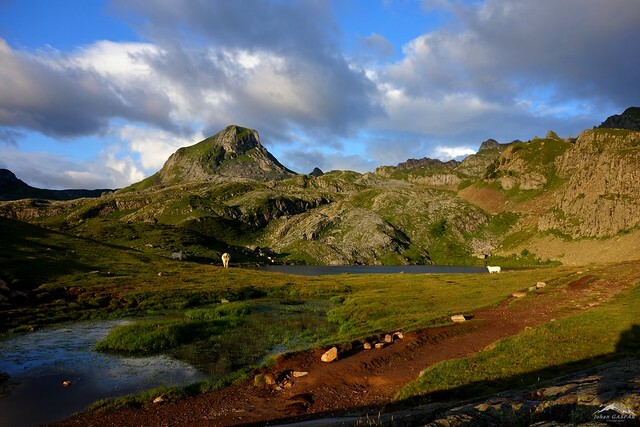 If we use image_url, we can point the API to any image hosted on a publicly accessible web address and tag it, which is exactly what we did for the mountain image above. This is most helpful if the user is attaching an image already uploaded onto the internet somewhere. For most applications, though, we want to allow the user to upload their own images, in which case we need to first understand another Imagga API, the uploads endpoint. There are two ways to handle tagging uploads with Imagga. In v1 of the API, it was a two-step process, requiring us first to upload the image, than use the returned upload_id to retrieve the tags. With v2, we now recommend you upload and tag the image all in one request, using the POST method to our tagging API. As such, that’s the method we’ll use here, but if you’re still using v1 and want to see an example of how the two-step process might work, check out the git tag upload-and-tag-v1 for an example. Important note: However you handle uploads, it’s important to know that Imagga does not permanently store the images you upload. For security purposes, they only remain on the Imagga server for 24 hours, so if you’re using the two-step approach you’ll want to ensure you download and store the tags for your uploads within that time period. If you need to have the images removed immediately, you can use the upload_id and a DELETE call to the API as well. As a reminder, for the full file context, check out the repo and use the tag upload-and-tag. So let’s walk through the code. First, we have an express router that takes a POST request to /tags with an image file upload. Our middleware (express-fileupload) has made our files easily accessible on the req.files hash, so all we have to do is grab that data and pass it along to our tags handler. For cleanliness, we’ve abstracted the specifics of the HTTP requests to a separate file in api-request.js, but you can see the flow here. Then, once our request returns with the tags, we simply pass that back on out to the frontend. As we noted above, the response format is exactly the same, so our frontend handler can be exactly the same regardless of whether this is a direct upload or an image url. Having a raw display of tags is helpful for debugging and development, but it is hardly the kind of user experience we want for our actual applications, so let’s take a look at connecting these tags to something more user-friendly. For this, we’re going to utilize a tagging library called tagify which turns our text input into a tag field. The flow will be that the user uploads an image, the API passes that on to Imagga and retrieves the tags, and then our widget will allow the user to accept or change the suggested tags. Any tag marked with 60% confidence or higher will be auto-suggested (or the top 3 tags, whichever is greater), and the user will be allowed to add more, but only from the list that Imagga returns. This ensures that while the user can correct or edit the tagging, they cannot add any completely inaccurate tags that might mislead other users on our site. Let’s walk through this from the top. showResults receives the tags from the Imagga API and immediately outputs the raw results into our pre tag for easy viewing. Again, we obviously wouldn’t include this in a final application, but it can be helpful during development, especially when we want to test our auto-suggest dropdown here shortly. Along with outputting the raw results, our next task before creating the auto-suggest input is to convert the list from Imagga into something our tagging plugin can understand. For this, we use getTagList. There we loop through all the suggested tags, creating two arrays: an auto array with the first three tags along with any others that are above the confidence threshold (60% in this case) and an all array which we’ll use for the suggestions dropdown. From there, we simply pass those along to tagify, either updating an existing input (if this isn’t the first image we’ve uploaded) or creating a new one. Finally, for a better user experience, we render the image the user uploaded in the preview element so they can be assured everything was processed correctly. Go ahead and upload the mountain image we used before (you can download it here), and take a look at how this all comes together. Once it’s uploaded, you should see it previewed on the right, along with three recommended tags: mountain, highland, and landscape. Now try adding some tags that are included farther down in the suggestions, such as “travel” or “peaceful.” Both of these should auto-complete as you type, just hit tab to add them to the list. Remember though, we want to prevent users from adding tags that are completely inaccurate, so now try typing something not in the list, such as “ocean.” You’ll see that not only is it not part of the suggestion dropdown, if you hit enter to try to add it, it will automatically be removed. 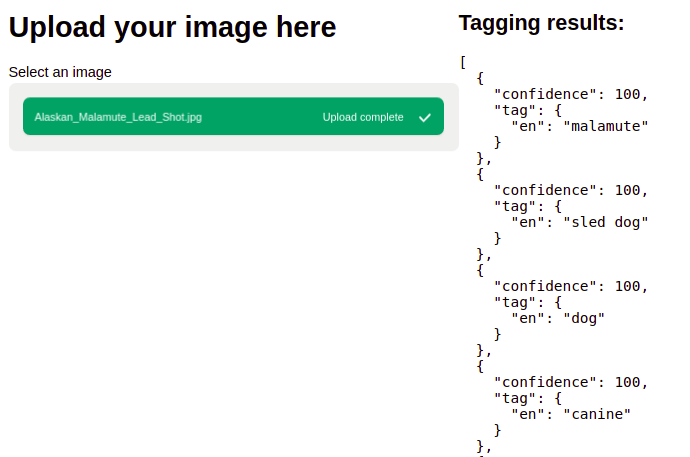 Today we’ve covered how the Imagga tagging and upload APIs work and how you can use them together to implement an auto-tagging widget within your NodeJS projects. Hopefully you can see how quickly and easily you can integrate them to enhance your users’ experiences and streamline your applications. Got a question or a suggestion for what we should build next? Tell us in the comments, we’d love to hear from you!